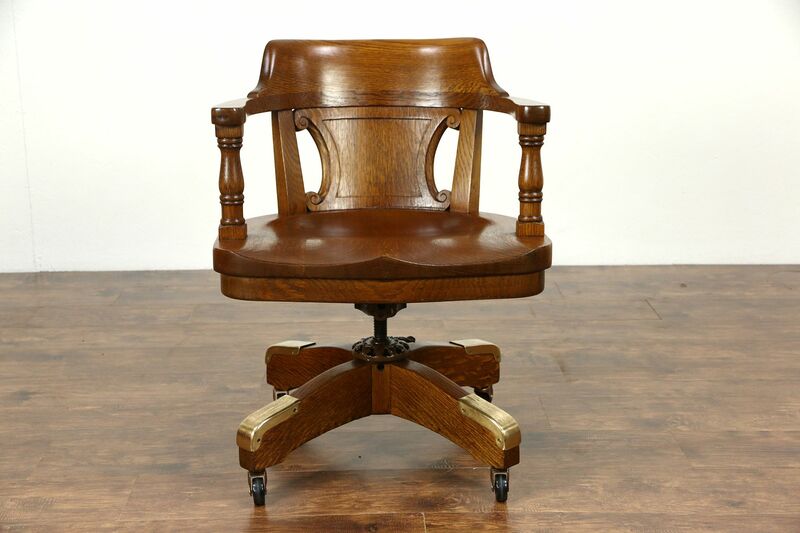 The absolute finest quality swivel desk armchair we have seen was made for the Milwaukee Courthouse about 1915. Solid quarter sawn oak, the restored finish is in excellent condition on this American made antique library or office furniture. The sculpted seat and deeply curved back are comfortable. Rock solid and heavy weight, the bases have bronze foot protectors. The original cast iron swivel mechanism has adjustable height and tilt. Ball bearing wheels are replacements. Measurements are 27" wide, 27" deep and 32" tall. The seat is 24" wide, 24" deep and 19" high, it adjust up and down from there.